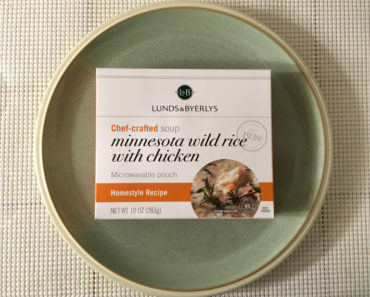 If you’ve never heard of the Lunds & Byerlys brand, it’s probably because you don’t live near Minneapolis, Minnesota. 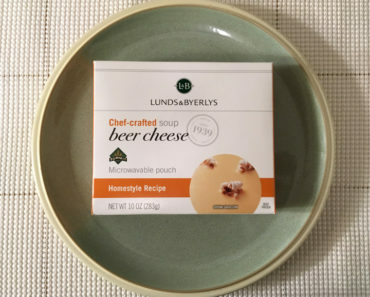 Lunds & Byerlys, also referred to as simply L&B, is a chain of upscale grocery stores in the Minneapolis area. 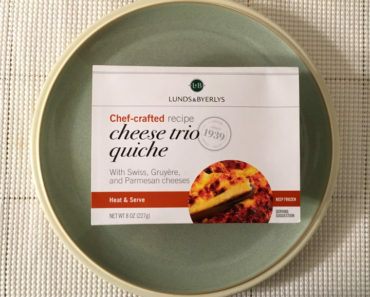 They have their own line of frozen food, and we really like a lot of it (their frozen lasagna is incredible), so we’ve been reviewing as much of it as we can. 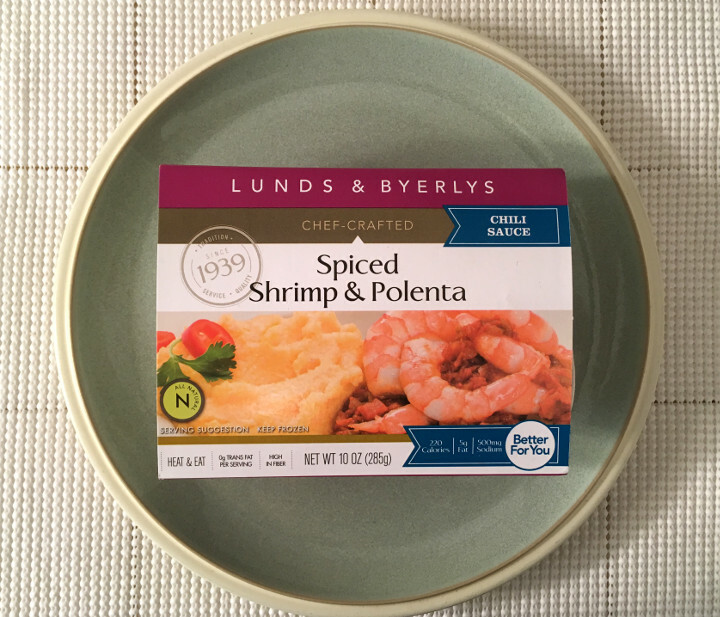 Today we’re checking out the Lunds & Byerlys Spiced Shrimp & Polenta. While we’re a little hesitant to try anything with two ampersands in the title (we’re kidding! ), we are pretty excited to see what this is all about. 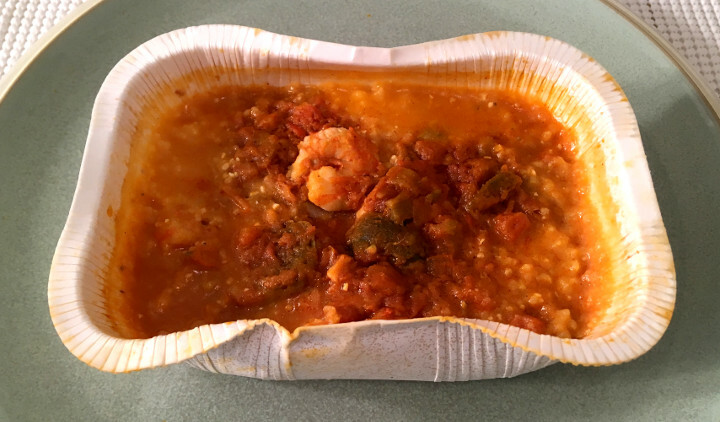 If you look at the packaging, it’s reasonable to assume this frozen meal would come in two parts — the shrimp and the polenta. After all, the photograph on the cover shows the two elements side-by-side. However, when you actually dig into this, you’ll notice that everything is mixed together into one lump. To be fair, this dish is actually layered. The polenta is at the bottom, the shrimp are mixed on top of that, and the whole thing is covered with a spicy chili sauce. We have to admit that we’re pretty disappointed with the shrimp in this dish. We found five pieces in the entire dish, which is at the low end of what we’d expect in a dish of this size. That’s not the part we’re complaining about, though — this shrimp is actually not very good. It’s chewy and rubbery, which makes it unpleasant to eat. The taste is decent, but we suspect that’s mostly because the chili sauce has such a potent flavor. 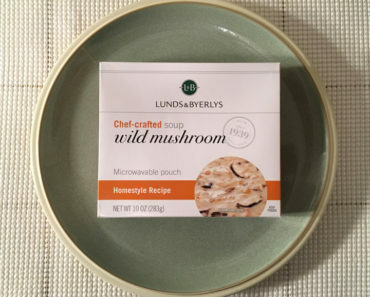 This item is quite low in calories, which surprised us. One package contains 220 calories (45 from fat) and 500 mg of sodium. 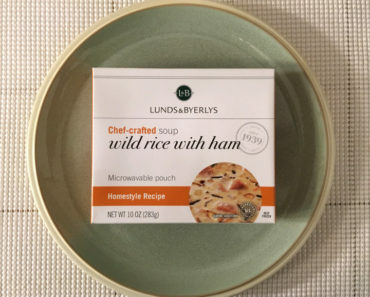 Since L&B doesn’t seem to care much if their items are absolutely loaded up with calories (check out the calorie count in a pan of Company Hash Browns), this comes as a nice little bonus. Plus, this meal is reasonably filling for that calorie range. 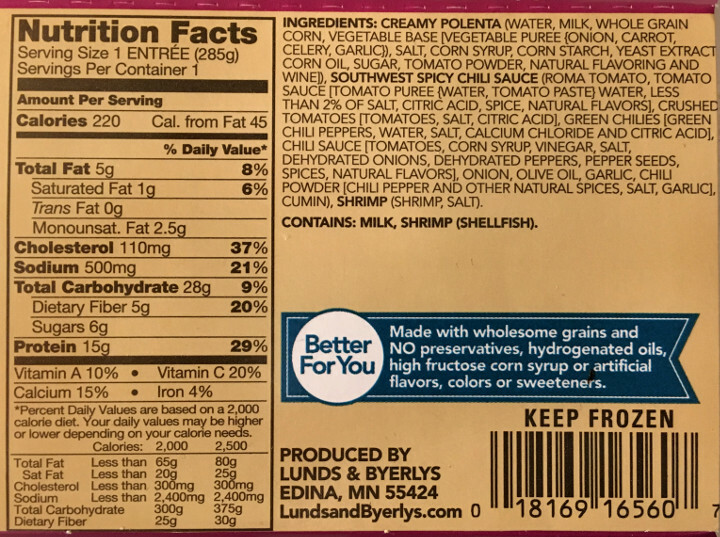 The Lunds & Byerlys Spiced Shrimp & Polenta is alright, though with some better-quality shrimp it could have been excellent. We certainly don’t think this is awful — in fact, we’ll probably end up eating this again in the future. We’re just a little disappointed because of how much potential this has. 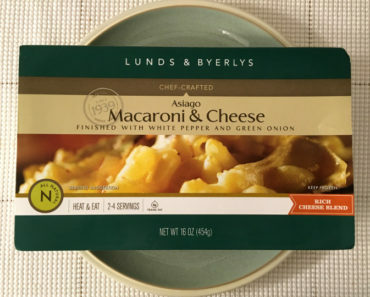 To learn more about the cooking instructions, nutrition content, or ingredients in this L&B frozen meal, check out our package scans below.